Sanchez (left) and Manning have similar statistics from their first four seasons in the NFL. 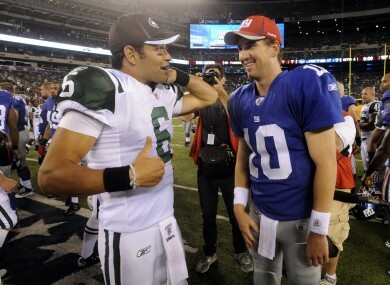 BOTH MARK SANCHEZ and Eli Manning were 23 in their first NFL season. And below is a look at Sanchez’s career compared to Manning’s first four seasons. It should give Jets fans hope that there is still time for Sanchez to become a great NFL quarterback. One of the better stats for looking at just how well a quarterback is playing is Adjusted Yards per Attempt (AYA*). In his first four seasons, Manning had an AYA of 5.6, nearly identical to Sanchez’ career mark of 5.7. In fact, both quarterbacks peaked in their second season and showed slight declines in years three and four. It wasn’t until his fifth and sixth seasons that Manning became a great quarterback. Also, the Jets are on pace for seven wins this season which would give them 35 during the Sanchez era. In Manning’s first four years, the Giants won, you guessed it, 35 games. This doesn’t mean Sanchez will become the next Manning. But their career arcs are eerily similar and it is a good sign that it is still possible. Email “Sports chart of the day: Why there’s still time for Mark Sanchez to improve”. Feedback on “Sports chart of the day: Why there’s still time for Mark Sanchez to improve”.